Turbulence in oceans, in the atmosphere or in industry is billions of times stronger than in lab experiments. Simply upscaling the lab results is not an option. Theoretically, however, there is a regime of turbulence in which scaling laws apply. 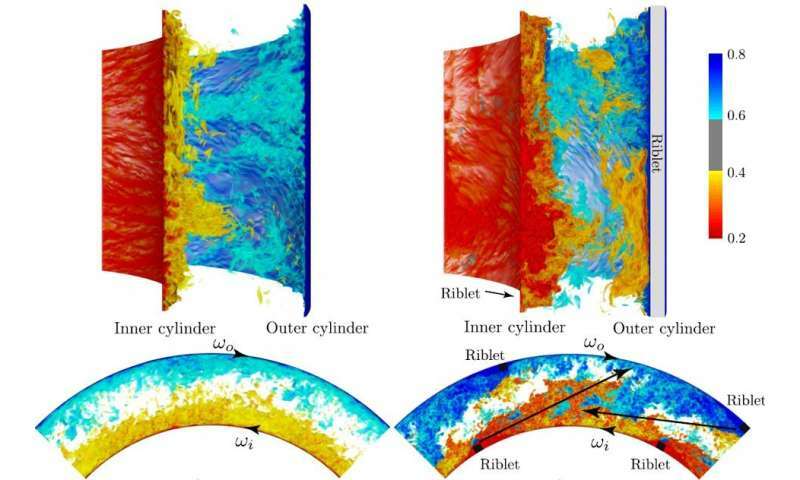 Researchers of University of Twente succeeded in reaching this 'asymptotic ultimate regime' of turbulence by introducing roughness at the surface at which turbulent liquid flows. They present their findings in Nature Physics of February 12. A better understanding of turbulence is one of the grand challenges of physics. Turbulence is found in industrial processes, the atmosphere, and in flows around ships or planes. Reynolds numbers, which measure the strength of turbulence, cannot be achieved in the lab at a realistic scale, and are much lower than in real-life processes. When measuring heat flow in the lab at weaker turbulence, the values can't simply be extrapolated to the higher Reynolds numbers in nature or industry. There is, however, a well-known theory that reveals more on infinitely high Reynolds numbers. It dates back to 1962. According to this theory of Robert Kraichnan, who was Albert Einstein's last assistant, there is an "asymptotic ultimate regime." In this regime, upscaling is possible. Even better, the regime can now be reached at the low Reynolds numbers that can be achieved in the lab. This is a new and indispensable link between theory and practice. The scientists of the Physics of Fluid group of Prof. Detlef Lohse altered the fluid flow at the surface by introducing roughness. For measuring turbulent flow, the group created a so-called Twente Turbulent Taylor-Couette setup, in which turbulent flow could be generated between two cylinders rotating independently of each other. At lower Reynolds numbers, the flow close to the wall is turbulent except for the boundary layer, where it still is laminar. Moving toward higher Reynolds numbers, the flow as a whole will be turbulent. With the introduction of ribs to the surface, the flow at the wall drastically changes, creating conditions that would normally only happen at much stronger turbulence. Simulations by Ph.D. student Xiajue Zhu and experiments by his colleague Ruben Verschoof are complementary in this. The advantage of simulations is that you get detailed information of the flow speed at any given point, while experiments can be done at higher Reynolds numbers. This is the result of years of simulation and experiments. Simulating turbulent flow requires huge computing power. A simulation on a single computer would take 10 million hours or 1140 years. The researchers therefore used supercomputers across Europe, using 2000 processors in parallel. The experiments are equally demanding and at the very limit—the Taylor-Couette setup, which is the largest and most advanced machine of its kind, has engines that consume 20 kilowatts of energy, while an additional 20 kW is needed to cool down the setup. What does turbulence have in common with an epidemic?